Only Interviews in English where Empanadas, Chimichurri sauce and Alfajores from Viva Argentina are. What Denise Stilmann has to say. Ten years ago, Denise Stilmann and Julian Ruiz moved to Montreal from Buenos Aires, fleeing an ongoing economical crisis. Though they only had $3,000 to their name, the couple saw it as a fresh start in a new place to call home. At the first glimpse of snow, they rushed over to nearby Jarry Park at 11 p.m., camera in hand to capture the moment. “It was all exciting,” said Ruiz, who quickly found work as a technician. It took Stilmann two weeks to find a job in a hotel restaurant downtown while juggling French classes at night. She had always loved to cook. As a teenager she hijacked her family’s kitchen, and by the age of 16 she was taking baking classes, bored by being half the age of anyone else enrolled. Besides the initial language barrier, Canada has been great since day one in 2004, they say. But something was missing. In Argentina they spent nights scouring cities for the best restaurants. Not the classiest or most expensive restaurants, Stilmann notes, but the corner dives or hidden gems where real Argentinian cooks ran the kitchens. In St-Lazare, where they moved in 2006, they craved the comfort of their homeland’s food culture. Stilmann missed the elaborate desserts and treats, Ruiz missed afternoon lunches with friends and family where wine poured freely and asado — picture beef grilling over a wood fire barbecue — was always a viable option. So in 2011, together they started La Générosité — an Argentinian cuisine catering business they run out of their home. Stilmann started with alfajores, a traditional dessert that pairs two small hockey-puck-sized cakes together with dulce de leche. Ruiz convinced her to bring empanadas into the mix, which she learned to cook from his mother and grandmother back home. Small accomplishments started adding up: tastings at SAQ’s were well-received, their raspberry sour cream pie won the best pie in town contest, they took home the prize for “best autonomous workers” at the Vaudreuil-Soulanges Ovations awards last year. The business started taking off, and in three years the demand for their cooking has kept growing steadily. Last month, Ruiz quit his job to start helping full time. Last week, the first industrial-sized mixer arrived at their home, placed in the basement they’ll be turning into a cooking space this winter, equipped with an extra over, deep-freeze, mixers and countertop space to roll dough and pastries. At their home in St-Lazare, besides meeting that demand, maintaining their Argentinian culture takes top priority: their two children, Catalina, 9, and Matias, 6, are both born here, but they don’t want them to forget where their family is from either. Only Spanish is spoken in the household between the two of them, and movies and cartoons from back home are often watched. This year’s World Cup, where Argentina lost in the final, was good for pride building. La Générosité is the family’s way of sharing that same culture with those around them. “The same love and quality that we put in when we cook for our kids, goes in when we cook for our clients,” Stilmann says. When Catalina starts school each year, she asks to bring her mom’s cooking in her lunch box to show classmates what her family eats. For her Grade 3 presentation at school next week, she’ll be showing her class how to make empanadas, having recorded a video of the process at home. “She wants to share our culture the same way we do,” Stilmann says. When family visits, they come bearing recipes of the new food trends happening back home, where they act as their eyes and ears. For years, Stilmann had asked for recipes from a cousin of Ruiz’s who was always in charge of baking the cakes for family reunions. Her requests had always been shot down, but after seeing what the family was trying to accomplish here, Stilmann finally received the recipes. Held at St. Lazare’s Bar Chez Maurice last Wednesday, Ovations 2013 was an evening of recognition of the successes of colleagues and competitors. And as co-emcee Jean-Marc Blanchard noted, it proved the spirit of entrepreneurship and innovation is thriving in Vaudreuil-Soulanges, even in public, parapublic and non-profit organizations. Some 47 businesses and organizations were entered in this year’s fifth edition, competing in nine categories: arts and culture/tourism, events and attractions; business and services, small companies; business and services, medium-size companies; business and services, large companies; community action and social economy – small; community action and social economy – large; public, parapublic, municipal; autonomous workers; and micro-companies. The evening’s big winner was Auberge des Gallant, the landmark Ste. Marthe auberge which suffered a potentially disastrous fire in April 2012. The past year has seen Linda and Gerry Gallant, their three sons and staff overseeing construction of the new hotel wing and conference centre as well as refurbishing the entire inn while preserving its trademark rustic ambiance. The Vaudreuil-Soulanges MRC won the public, parapublic, municipal prize for its Vaudreuil- Dorion ecocentre, the first of several recycling depots that will enable the region to help meet Quebec’s goal of zero landfill by 2020. This was a personal triumph for MRC director-general Guy-Lin Beaudoin and deputy director-general Raymond Malo, who sold the concept to the region’s mayors. The ecocentres will enable the MRC’s 23 municipalities to delay or even avoid having to subsidize prohibitively expensive biomethanization and gasification facilities. The atmosphere was relaxed and festive, with the crowd entusiastically greeting the announcement of each winner. Every category featured videos of the entrants courtesy of les Hebdos du Suroît and credit for the flawless staging goes to Chez Maurice owner Richard Chartrand. Sunny’s Restaurant catered a steady flow of delicacies to the tables. If applause was anything to go by, the biggest success story of the evening was also the smallest. St. Lazare’s La Générosité and chef Denise Stilmann won in the autonomous workers category with her gourmet empanandas, cakes and other products. In her moving acceptance speech, the Argentine immigrant praised Quebec and Canada for giving her the opportunity to succeed. There was no greater testimony to the value of an event such as this. It was a tough call, admitted both judges. District 4 councillor Michel Lambert and pastry chef Thierry Juvien had the task of finding the winning entry among the nine pies submitted for last Tuesday’s second annual St. Lazare Pie Contest. The nine couldn’t have been more different, ranging from the traditional (deep dish apple, banana custard, pecan, sugar) to the avant-garde (chocolate raspberry torte) to the daring (a tofu creation sweetened with maple syrup and topped with dollops of whipped cream). The judges were under considerable pressure to pick a winner quickly. It had begun to rain on the weekly Farmer’s Market. Competitors, friends and families took shelter under kiosks in the town hall parking lot where the weekly Farmer’s Market was winding down. It was excruciating watching the judges savouring each bite as the crowd waited for a taste. Most hadn’t eaten since lunch. Finally, a winner was declared. Denise Stilmann, accompanied by daughter Catalina Ruiz and son Mathias Ruiz, was awarded a $200 gift basket of Farmer’s Market products for their raspberry sour cream pie, a light yet intensely satifying chilled creation quite unlike anything else on the table. Ville de Saint-Lazare find out the best pie in town in the company of the judges: Michel Lambert, District 4 councillor and Thierry Juvien, Farmers market organizer and a pastry cook! «The choice was not easy this year! We had 9 participants, who where all, I’ll have to admit, very good cook. Thanks to everyone for you great participation. We have found a real cordon bleu! «The crosswinds raspberry sour cream pie of Mrs Denise Stilmann and her daughter Catalina Ruiz and her son Mathias Ruiz was a real delight! » declare the judges. Congratulations to Mrs Denise Stilmann and her daughter Catalina Ruiz and her son Mathias Ruiz! 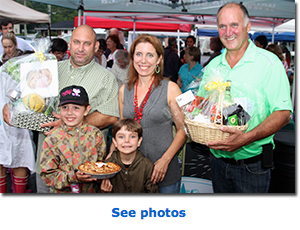 They won a gift basket with products from the Farmers market, worth $200. You have the best pie in town!